There was a time when you could afford to ignore insane ideas in America, but these days you can barely manage to blurt out, "Nobody can be that stupid," before some liberal starts calling for them to be made into laws on MSNBC. So it is with the demands that the Redskins change their name, but this time 50 Democrat senators and bureaucrats at the U.S. Patent and Trademark Office are tagging along with the Left-Wing loon patrol. That really shouldn't surprise anyone because it has become the standard modus operandi for liberals. Pick a group of people (In this case, Indians), choose some trivial wedge issue that does nothing of significance to improve their lives, and declare that's the only issue that matters to them and that anyone who doesn't agree, hates them. It's division, it's hatred, it's destruction, and it's what liberals are all about. While it's impossible to critique every dumb liberal idea in any one article, it's not hard to explain why pushing the Redskins to change their name is foolish. 1) The word "Redskin" isn't a racial slur: "Redskin" began as a descriptive term just like "black" or "white." No one uses the word "Redskin" as a racial slur for Indians -- and there's debate over whether anyone EVER did. On the other hand, if someone drops the "N-bomb," Jessie Jackson talks about "Hymietown," or Chris Rock talks about "crackers," those are recognized as racial slurs. So in essence, what liberals are trying to do is create a racial slur out of thin air. Maybe conservatives should try that some time. "(Gasp) You said Joe Biden? Why do you hate white people so much?" 2) Redskin apparently isn't offensive to most Native Americans: In modern America, you can find people who are offended by just about anything. So, it's no surprise that there are some Indians who don't like the term Redskin. However, in 2004 a National Annenberg Election Survey found that 90% of Native Americans had no problem with the name. Furthermore, there’s a lot of anecdotal evidence that shows Native Americans don’t find the word “Redskins” offensive. In Anadarko, Oklahoma, which is often billed as the "Indian Capital of the Nation" where seven tribes make their home, there has been a Redskin Theatre there for 60 years. Red Mesa High School, which is located on a Navajo reservation in Arizona has a Redskin mascot and logo. Is the idea here supposed to be that these Indians are too stupid to know that they’re being insulted? 3) It’s not the government’s business: At the end of the day, the Redskins are going to be fine whether they change their name or not, Daniel Snyder is still going to be filthy rich, and the liberals who claim to be horribly offended by this will claim to be horribly offended by something else. However, it’s grating to have the government involved in this issue. We have an illegal alien invasion happening on our southern border, the debt is out of control, IRS employees are taking the 5th, Iraq is falling apart, the economy still stinks, we have a record number of Americans that have dropped out of the labor force, and the Senate Majority Leader and many of his colleagues are obsessively focusing on the Redskins while the patent office is playing political games with the name of the team. It’s like our house is burning down with the kids upstairs and the government is too busy obsessing over who Jennifer Anniston is dating these days to do anything about it. Who cares? Take care of the real problems we have and if the fans decide they don’t like the name of the Redskins enough to stop buying tickets and merchandise, the name will take care of itself. As some of you may know, our team began 81 years ago -- in 1932 -- with the name “Boston Braves.” The following year, the franchise name was changed to the “Boston Redskins.” On that inaugural Redskins team, four players and our Head Coach were Native Americans. The name was never a label. It was, and continues to be, a badge of honor. In 1971, our legendary coach, the late George Allen, consulted with the Red Cloud Athletic Fund located on the Pine Ridge Indian Reservation in South Dakota and designed our emblem on the Redskins helmets. Several years later, Coach Allen was honored by the Red Cloud Athletic Fund. On the wall at our Ashburn, Virginia, offices is the plaque given to Coach Allen -- a source of pride for all of us. 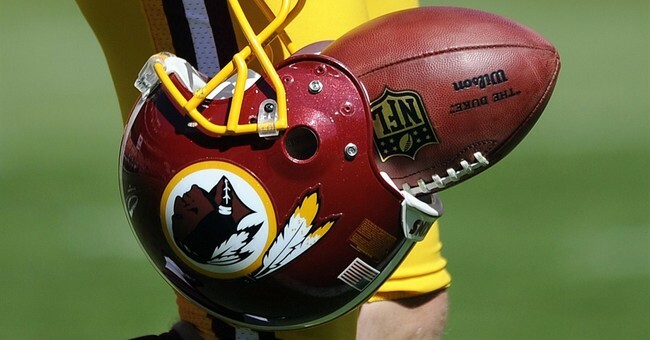 “Washington Redskins is more than a name we have called our football team for over eight decades. It is a symbol of everything we stand for: strength, courage, pride, and respect -- the same values we know guide Native Americans and which are embedded throughout their rich history as the original Americans. The Redskins have done more to reach out, consult with, and take into consideration the feelings of Native Americans than 99% of the people criticizing them – and certainly more than any of the Democrats in the Senate. They’ve also created the Washington Redskins Original Americans Foundation, which actually does something to help Native Americans, unlike all these demands that the Redskins change their name. 5) There is no end to this: When liberals make insane demands like this, some people are tempted to give in to them in hopes that it will shut them up and they’ll go away. “Oh, just change the name of the Redskins and then we won’t have to hear about this anymore.” It NEVER works like that. Just to name one example of what comes next, there are already liberals demanding that the military change the name of Apache helicopters because that’s supposedly racist. There are also already demands being made that the Braves, Indians, Blackhawks and Chiefs change their names as well. Just to give you an idea of how far the liberals would go with this if they were able, when James O’Keefe was at Rutgers, as a goof, he managed to get Lucky Charms temporarily banned at his college by claiming they were racially insensitive to the Irish. If you want to spend your whole life placating the world’s most easily offended people, keep rewarding whiners for whining.